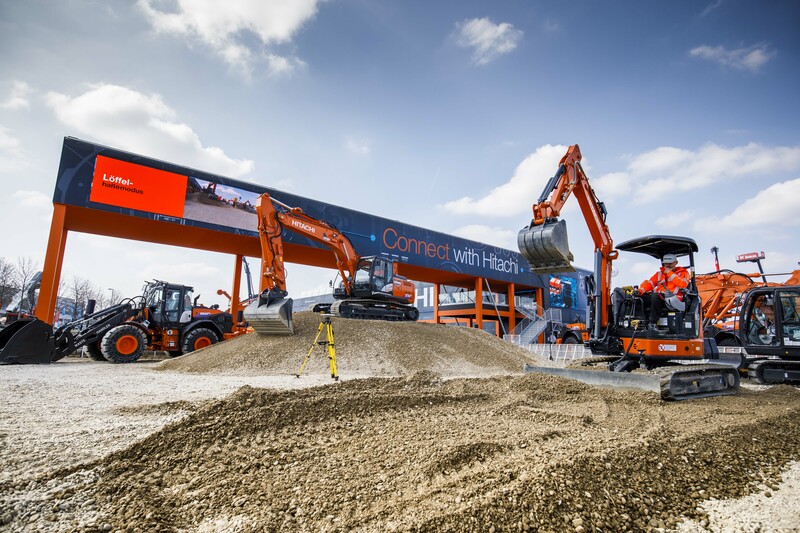 Hitachi Construction Machinery (Europe) NV (HCME) will be among the leading manufacturers at Bauma 2019 with more than 30 machines on show from 8 to 14 April. The company will showcase a wide range of products and services on stand number FN/718. The 6,495m² display will be modelled on HCME’s theme for the event, “Connect with Hitachi”. This illustrates how customers access a world of connectivity when they purchase a Hitachi machine. They benefit from not only the connective technologies incorporated in Hitachi equipment, but also the connection to people within our dealer network through comprehensive after-sales support. Unveiled to the general public for the first time, the ultra-large EX1200-7 and EX2600-7 mining excavators are certain to attract visitors to the HCME stand. They will be joined by Hitachi’s first ICT hydraulic excavator in Europe, the ZX210X-6. Informative demonstrations of this, and several other innovative models, will take place six times a day in the dedicated Hitachi demo area. Another debut is the ZE85 zero-emission electric excavator, which will also be shown in the demo area. Produced by the European Application Centre (EAC) – a joint venture between Hitachi Construction Machinery Co., Ltd and KTEG – it is joined by a smaller model, the ZE19, on the Hitachi stand. These concept models have a long battery life due to proven power management, and are exceptionally quiet and safe to operate. HCME will also present a broad selection of the latest Zaxis-6 mini and compact excavators, from the ZX17U-6 to the ZX85USB-6, and the ZW75-6 and ZW95-6 compact wheel loaders, which have been updated to comply with Stage V emissions requirements. A wide variety of medium and large wheel loaders, medium crawler excavators and wheeled excavators, plus special application machinery for different industry applications and special application products from the EAC will complete the Hitachi stand. In addition, Hitachi will draw attention to its approved used and rental programmes during Bauma 2019. A ZX130-5 Premium Used machine is on display – complete with HoloLens headset, which highlights the benefits of using Hitachi Genuine Parts – along with a ZX210-6 medium excavator and a ZW250-6 wheel loader to highlight Premium Rental. Hitachi is also presenting its innovative remote monitoring solutions including the new ConSite Pocket app. This enables customers to manage their machines wherever they are, via their smartphone. As part of ConSite, engine and hydraulic oil quality is continuously monitored, thanks to specially developed sensors. This provides peace of mind for customers and a reduced total cost of ownership. Visitors will also have a chance to test their skills on the EH5000AC-3 dump truck simulator from Immersive Technologies. To ensure that they have the best experience on the Hitachi stand, they can download a dedicated Bauma app in advance. © 2019 Hitachi Construction Machinery Europe NV. All rights reserved. There are cookies which are strictly necessary for the normal Sites functions. These cookies cannot be switched off because the websites wouldn’t work properly anymore. However, these identifiers do not store any personal data.